First and foremost, it’s a pain to try and log every encounter I have with media, both intended and unintended, considering that media content is, quite literally, EVERYWHERE. As I’m sitting here writing this, after my two-day media logging extravaganza, I have some instrumental music playing, the TV on, and am procrastinating by checking random internet sites every few minutes. Not only that, but the weather is fairly dreary out today, so any stimulus helps to relieve some of my lazy rainy day syndrome. I didn’t think I was going to be surprised by my media habits, but I really shocked myself with this assignment. As a film major, I enjoy watching videos in my free time, whether on TV, YouTube, or Vimeo. Therefore, most of my time was spent watching some video based media. Beyond that, of my 31 waking hours during the two school days I recorded my log, 16.5 were spent in the presence of media. That is just over half of waking hours. This slightly alarming fact made me reevaluate my entire life and consider joining the Franciscan order. I mean, really. Think about that. HALF of my waking hours are spent in a nonproductive state, enjoying someone else’s messages. I spent two hours total listening to podcasts as I walked between classes. Another two and a half listening to music. And these were just the hours I was able to recognize and record! On Friday, after class, I went to Target and then Marshalls, both of which had ambient music playing over the loudspeakers. I didn’t even realize that they had been playing until a song came on that I recognized. 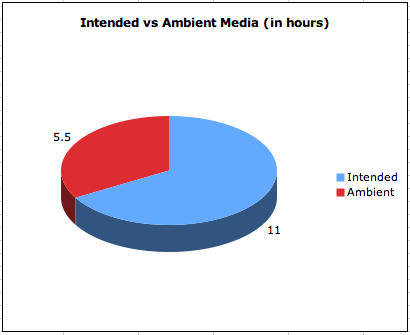 Of the 16.5 hours I recorded, 5.5 were spent in the presence of ambient media that I wasn’t actively engaged in. This included music and videos my roommate was enjoying, as well as the music at the stores I visited. Another thing that I wasn’t able to record was the advertisements and flyers I encountered throughout the day. As I walked around campus during my school day, I ran into a bunch of flyers promoting Jonah Hill’s new movie, “The Sitter.” I’m not sure if someone posted these on their own accord or if a marketing company was hired to do it, but it represents another invasive form of media. I wish I could have logged the amount of time I had viewed advertisements because I’m sure it would have raised my 16.5 hours to an even more alarming number. Having completed this part of the assignment, I must say that I’m not looking forward to evading all forms of media. I had a hard enough time trying to find all the media in my daily life, I can’t even imagine trying to avoid it!